When you shop at the market, you’re supporting your neighbors and voting with your dollars. For every dollar spent locally, $.68 will stay in your community and you’re directly helping someone provide for their family. Farming is hard, and prices are low. By selling directly to the consumer, these businesses are able to get a better return than they might through wholesale accounts. Unless you grew up on a farm, most Americans don't have a clear idea about seasonality. We're used to being able to buy whatever we want, when we want, but at the market you'll be able to stay in tune with the seasons and savor produce when it's at it's peak. Strawberries in spring, apples in the fall, and so on. There's more to Fall than pumpkin spice! On average, food in the US travels 1500 miles from the farm to our table. At the market, our average is just 13.2 miles. The tomatoes you buy mid-summer are usually picked a day or two before you bought them. You'll also be able to buy them in bulk, to preserve the fresh seasons for those cold winter nights. Kohlrabi, Sunchokes, Microgreens, Heirloom Tomatoes, Spanish Radishes, Purple Cauliflower, and Paw Paws. At the market, you’ll find many products that you may have never tried before! If you’d like dive in further, join a CSA to get a weekly box of produce, or other goods and tips straight from the farmer. 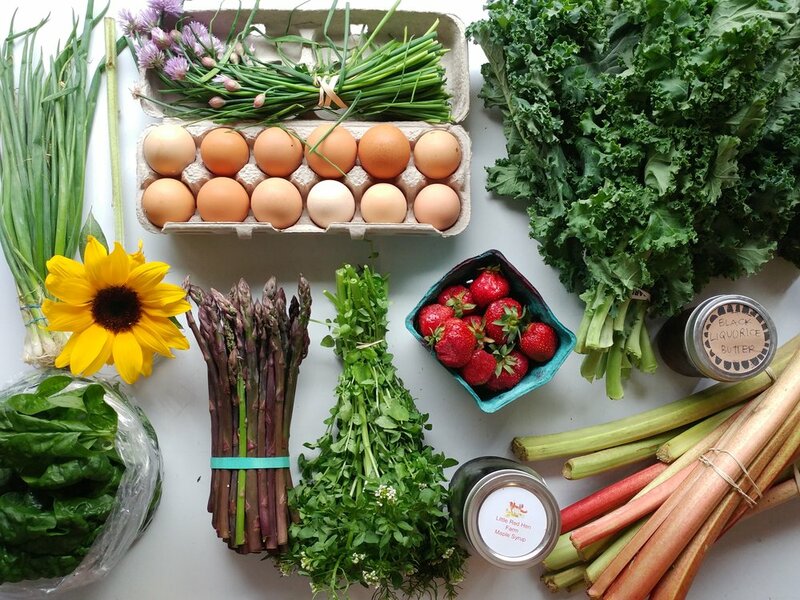 Farmers Markets are more than just the best, most fresh place to grocery shop. They're a community gathering space, and a treasured weekend social event to connect over something we all love- food. Stop by for the vegetables and stay for the music, friendships, food trucks, and more! Many small farms are operating under organic practices, although they might not be certified due to prices and time constraints. These small farms are more likely to compost and practice field rotations that help enhance soil health, and ultimately protect our environment. Every time you shop at the market, you get to chat with a farmer or producer. Talk to them and learn their stories, practices, and goals. You'll never get that experience or form those relationships at a regular grocery store. At the market you’ll find meats, cheeses, and eggs from animals that have been raised without hormones or antibiotics. Cows that have grazed on open pastures, pigs that foraged through the woods, and chickens are often spared the cramped cages and other poor living conditions. Labels like grass-fed and cage-free aren’t all their cracked up to be, and knowing your farmer is the best way to know the living conditions of our food sources. If you look through your kitchen garbage, you’ll probably find that most of it is full of food packaging. Fruit leather wrappers, produce bags for every vegetable, plastic berry clamshells… A lot of this can easily be avoided when you buy produce directly from the producer. Bring your own bags for everything, and start collecting those rubber bands and egg cartons to be reused. The best part about farmers markets? Learning to cook! Farmers have the best tips and tricks on how to prepare their goods. Try the samples, check out Taste of the Market to see what's in season, and visit the market blog for weekly meal plans and inspiration.